I thought long and hard about what to serve my first guests and how to first break in the new oven. The overall dinner menu wasn’t that exciting (Lopez Bakery chips and salsa, blueberry sparkling lemonade, your standard summer hash brown casserole, Pick N’Save’s fancy burgers, and Nicole’s cucumber, tomato and feta salad), but I wanted something fun and appropriate for dessert. 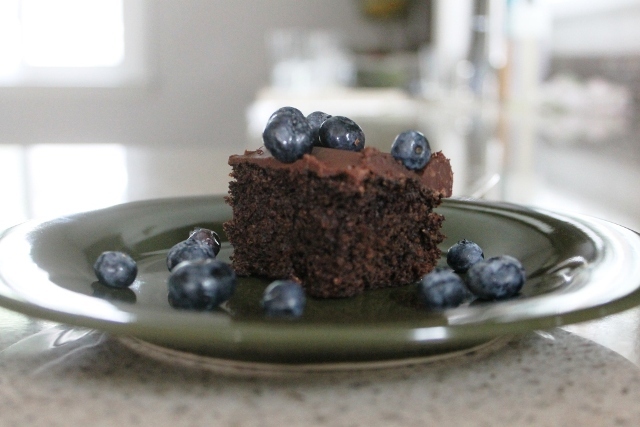 So without further ado, the first recipe to come out of Chez Truly, MM: Blueberry Chocolate Cake! 1. Preheat oven to 350 degrees. 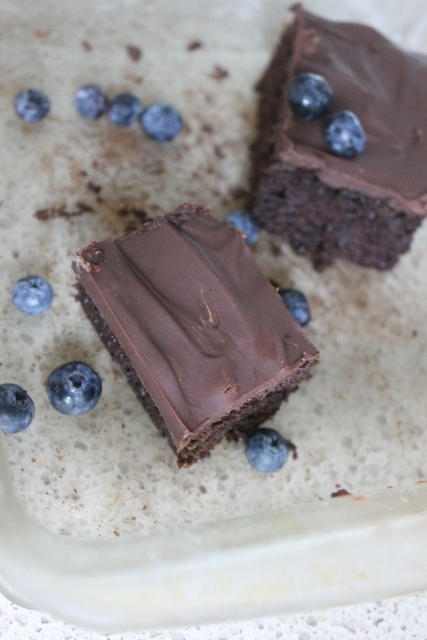 In medium bowl, combine flour, sugar, cocoa powder, baking powder, baking soda, and salt. In blender, combine water, blueberries, and the egg. Cover and blend until smooth. Add to flour mixture. Stir until well combined. Pour into greased 8" baking pan. 2. Bake 30 minutes or until a toothpick inserted in center comes out clean. Cool completely on wire rack. 3. In small microwave-safe bowl, combine butter and chocolate chips (and optional Cointreau). Microwave for 30 seconds and stir. Repeat until mixture is completely melted. This step should take around one minute, depending on the power of your microwave. It can also be done on the stove top if you prefer not to microwave. 4. Immediately pour ganache over cake. Smooth to cover evenly. Let cool. 5. Cut cake into squares to serve. Top with fresh blueberries.